Here are 10 tips to help you and your pet to have a safe and happy holiday season. Securely anchor your tree so it doesn't tip and fall, causing possible injury, if a pet is playing. Make sure you do not let pets drink tree water out of the stand, as it can be dangerous if ingested. Try to either elevate the tree or hang ornaments only on the upper most branches, to avoid broken ornaments that can cause injury. 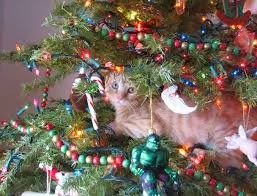 Avoid tinsel...pretty, sparkling tinsel is very enticing to pets, but it can cause an obstruction if ingested. Place candles in a place where they cannot easily be knocked over by an excited pet. Conceal electrical cords with heavy duty plastic to keep a chewing pet away from danger. Be sure to keep chocolate away from pets, but be aware that dark chocolate, especially baker’s chocolate, is especially toxic. Keep the sweet treats like: gum, candy, and breath mints with xylitol (an artificial sweetener) away from pets. It is extremely toxic. Be careful when choosing a gift for your pet. Dogs have been known to chew up toys, which then cause a blockage and require veterinarian assistance. Instead offer health treats or indestructible toys. With all the excitement of the season it is important that you give your pet his own quiet space to retreat to—complete with fresh water and a place to snuggle. Pets often become anxious during this time of year.